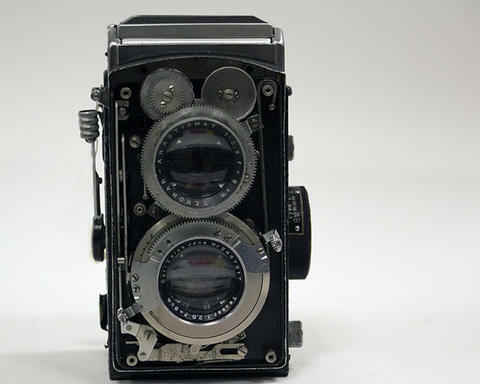 Item is the last pre-war Ikoflex model, released in June of 1939 and made in Stuttgart, Germany. For 6 x 6 cm exposures on 120 format roll film. The focusing screen has a condenser, magnifier for focusing and an “albada” finder (sports finder) in the hood. The viewing lens is an f3.5, 7.5 cm Teronar Anastigmat, lower lens is a Triotar f 3.5, 7.5 cm, Carl Zeiss Jena. Shutter is a Zeiss Ikon Compur Rapid, with speeds of 1 - 1/400 second and Bulb. Model number "853/16" is stamped under the lens assembly. Inside the viewfinder is a chart for seasonal exposure times. This is a demonstation camera that is not fully functional. The front panel removed to show how this type of camera functions.